A try in the last move of the match flattered the hosts who on their own turf proved to just have the edge. Until the last quarter Biggleswade had been in touch of a losing bonus point but it just slipped away. Coach Shane Manning was missing because of a nose operation, veteran prop Jimmy Caulfield was unwell and club captain Dom Nott was on the subs bench as he had only just arrived back from three weeks in New Zealand. 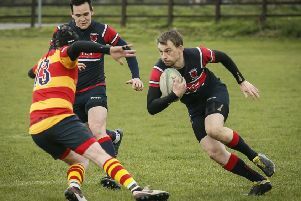 Second teamers Andy Burke and Arran Pickering stepped up to the mark with solid performances as replacement front rowers. Burke was making his first appearance since April of last year. Despite the recent rain the pitch was in good condition but the nippy wind chilled the fingers and dropped passes were legion in the first 20 minutes. After a bright start spoilt by the handling mistakes it was Daventry who took the lead after a quarter of an hour with an unconverted try. The lead was short lived as university student Tom Flather scored Biggleswade’s only try. It was a solo effort as he hacked on a dropped ball to regather and touchdown. Over the Christmas holiday he has played three games for the club and scored a try in each one. Luke Haverly added the conversion and then a couple of penalties. Did he get a new pair of boots for Christmas? Daventry hit back with a penalty of their own and then levelled the scores with a second try just before the break. With the advantage of the slope and the cross-wind Daventry scored a penalty and another two tries in the second half with no reply from Biggleswade. But the Biggy Boys did have their chances. The front row move at the front of the line almost came off being stopped inches short of the line. Flanker Liam Dunne charged down an attempted clearance kick on the edge of Daventry’s ‘22’ and almost scrambled through for the try. Biggleswade had an attacking scrum five metres out but lost the put in and Daventry edged to safety again. The result sends Biggleswade down to sixth place in the league out of 12 teams. Next up is a home fixture against Dunstablians who Biggleswade beat away from home 19-3. The match kicks off at 2.15pm. Biggleswade then have a week off from league action before playing Leicester Forest away and Northampton BBOB at home.